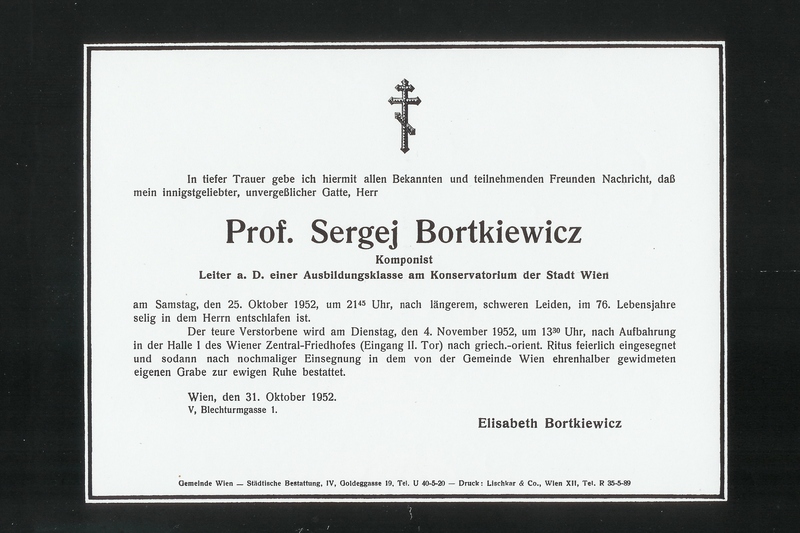 Bortkiewicz died on 25 October 1952 in the Algemeines Krankenhaus in Vienna. His wife, Elisabeth Bortkiewicz-Geraklitova was his sole heir. The Bortkiewicz Gemeinde tried to keep the memory of Bortkiewicz’ music alive. Elisabeth Bortkiewicz stayed as subtenant of Maria Cernas in the Blechturmgasse 1 Tür 5. On 9 March 1960 Elisabeth Bortkiewicz died in the Willergasse 24, Rodaun, Wien (Vienna). Her heirs were two daughters of her brother Sergei Ilyanko. Elisabeth Schubert-Tscharré and Grete Schuster received a legacy. By then the memory of Bortkiewicz’ music had already faded away. His music went out of print and piano and orchestral scores became very hard to obtain.